Black and white image of three women, seated inside an elaborate horse-drawn carriage, two in the back and one in the front seat holding the reins and with a small child in a white dress beside her. Another child, a girl, is seated on the railing of the bridge in front of the horses; she wears a short light colored dress and has short hair, some of it pulled to the back top of her head in a bow. 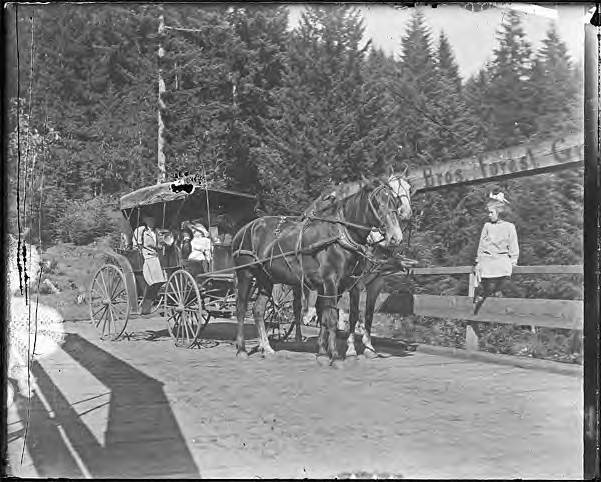 The carriage sits on a wooden bridge and the lettering 'Bros. Forest Gr' is just visible on the upper truss. The women wear hats and suits; one hat is large and floppy. The other hats are smaller and sit more to the front of their heads.